The first public beta version of Sweet Home 3D 3.5 is out and can be tested with Java Web Start link. - improved magnetism of furniture along walls with anti collision system (including round walls). This new version centers also zoom on the mouse cursor when zoom is done with mouse wheel while Ctrl key is pressed (Cmd under Mac OS X). I made also the ground color vary according to light power setting. To ensure a better rendering at default settings, the ground color of home files made with previous versions will be automatically updated. 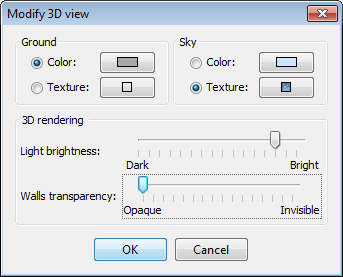 This might lead to some small changes in rendering, according to the light power you set in 3D view modification pane. Hope you'll like this new version, and you'll feel that placing furniture will be much easier now. Anti collision works fine. However an "anti-collision" checkbox in each furniture properties could be usefull for special needs. Thanks for that new upgrade ! However an "anti-collision" checkbox in each furniture properties could be usefull for special needs. Anti collision and magnetism can be disabled by pressing the shift while moving a piece, or by disabling magnetism in the preferences pane. Can beta be downloaded (no using web based startup)? No but it can run offline after first launch. Or use source code to build a Jar executable or an installer. 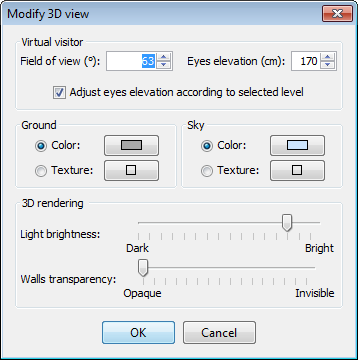 Tonight, the beta 3 brings the new Adjust eyes elevation according to selected level option in the 3D view modification pane, which layout was updated. This option is selected by default for new homes. In the version 3.5 Beta 4, I removed Virtual visitor attributes from the 3D view modification pane, and created a new virtual visitor modification pane showing all the coordinates of the virtual visitor and its angles. This new dialog box can be displayed by double clicking on the virtual visitor in the plan or by selecting the new 3D view > Modify virtual visitor menu item. 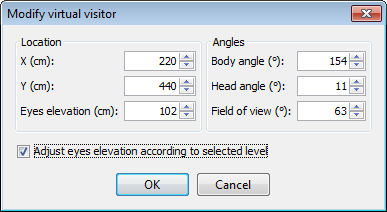 The Adjust eyes elevation according to selected level option is displayed only for multi level homes. In this version, I also reversed the pitch rotation in aerial view mode. Sorry for any inconvenience, but all 3D software behaves this way and I should have better noticed from the beginning. May I ask how to make a stop at Sweet Home ? -.-"